We invite you to have a life changing experience for your Body, Mind and Spirit. This safe and effective program includes guidance, education, detox cuisine and naturopathic therapies. Special classes, talks and presentations are designed to support you during your detox and to give you the tools and inspiration to make healthier lifestyle choices when you return home. We are now also promoting retreats in Costa Rica, Argentina, Brazil, UK and Spain. Please consult our schedule for more information. Detox & relax your body; cleanse & calm your mind in rural Mafra, Portugal. See the benefits of fasting, on digestion, allergies, skin disorders, back pain, etc. Change your relationship to food with daily inspirational talks on food, nutrition and healthy living. Morning and evening Yoga class and group Meditation. See Program Here. 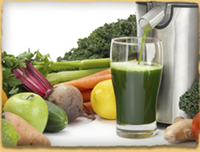 Enjoy fresh & healthy homemade fruit and vegetable juices and delicious vegetarian meals. A Juice Fasting Detox is a fully comprehensive cleansing programme that will revitalize you for good health, weight loss and mental clarity. Juice fasting with high energy juices gives your digestive system the rest it needs and you will learn how to purify your digestive system for optimal nutrient absorption. Your stamina and vitality will build every day with yoga, meditation and walking. If you suffer from bad eating habits, chronic tiredness, mood swings, and negative thought patterns, there is no better way to a healthier, happier you. Yoga and fasting go hand in hand. The yoga classes are suited to people of all levels. The combination of gentle moving, stretching and twisting together with deep breathing, speeds up the detox process. Through the practice of yoga one can find an inner peace and stillness, which reduces the toxic effects of stress and anxiety. Often during a fast, when the putrefied deposits are being eliminated from the system, old and sometimes forgotten emotions may surface. Yoga can help to deal with these. An Ananda Marga Fasting Retreat is so much more than a holiday. It's a valuable investment in your self. Unlike a conventional hotel, Our retreat center is a home-from-home that brings people together as a family, where the joyful feeling of your time here continues long after the retreat ends. Here is an opportunity to come to complete rest, to reflect and to feel completely at ease with yourself and others in a nurturing environment.